Cut the chicken into approximately 1 inch cubes. Cut the vegetables into approximately 1 inch by 1 inch pieces. Alternate skewering veggies and chicken on your kabob sticks. 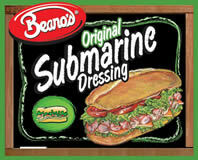 Empty the bottle of Beano’s Original Submarine Dressing into a deep walled dish or plastic bag big enough for the kabobs to fit. Place the kabobs in the dish or bag and let marinate for 30-45 minutes making sure to rotate the kabobs every 5-10 minutes. Once finished, discard used dressing. Grill or broil kabobs until a meat thermometer inserted into the chicken reads 160F.